NETSCOUT’s network, application and security assurance solutions are empowering government IT teams as they embrace and deploy Cloud Smart technology, defend against internal and external cyber-attacks, and modernize their infrastructure to achieve their missions and objectives. When Federal Agencies utilize NETSCOUT technology, they accelerate their innovation, improve efficiencies, and become more effective as they deliver services to citizens, residents, employees, and contractors. In any cloud environment (public, private or hybrid), sophisticated and intelligent service assurance tools are essential for both the migration to the cloud and subsequent operation in the cloud. Agencies need solutions that work with servers in a multitude of environments, including physical, virtualized, private cloud, IaaS public cloud or hybrid cloud deployments. Governmental IT teams want to migrate applications and services to the cloud with confidence and be able to drastically reduce CapEx and OpEx spending without compromising the end-user experience of the citizens and residents they serve. Another aspect of a high-quality experience with cloud-based services requires an ability to evaluate the service levels provided by third-party vendors to pinpoint the root cause of issues so the right remediation can be applied. 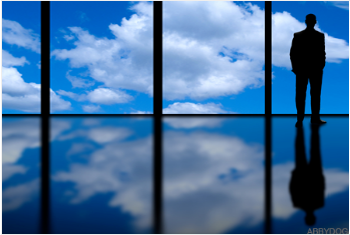 The U.S. government says it’s time to move from Cloud First to Cloud Smart. NETSCOUT’s innovative technology and Smart Data approach enables pervasive visibility of Public, Private and Hybrid Cloud environments. Government agencies are embracing Cloud technologies to modernize their infrastructure to deliver digital services at scale, more rapidly and more cost effectively. Select below to filter by Type or Product to refine your results. 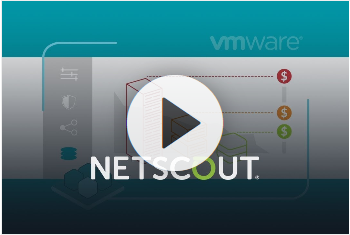 Video Ensure Secure and Successful VMware NSX and Multi-Cloud Environments | NETSCOUT Service Assurance Migrating to a VMware NSX environment is a major transformation for any enterprise. NSX offers simplified management, micro-segmentation security, provisioning agility and improved data center economics. As your organization benefits from accelerated service velocity, enhanced security and rapid disaster recovery, successful migration will depend on overcoming the lack of visibility into application dependencies and user experience. Your bottom line depends on continuous availability and quality end-user experience; anything less, puts your business at risk. This video will illustrate how NETSCOUT’s innovative smart data technology delivers the service assurance solution you need to eliminate blind spots and provide a seamless view that scales across your NSX, cloud and legacy environments. Case Study Migrating Services to Hybrid Cloud with Confidence The company’s health and safety management system is critical for not only protecting employees and the environment, but also for maintaining regulatory compliance. This system monitors air, water, and waste management, as well as loss prevention, document management and integration. Much of this relies on “always-on” digital services. This puts IT under significant pressure to be more proactive in ensuring quality and availability of critical services to avoid stiff regulatory fines/penalties which can range into the billions of dollars, and reputational damage with the public. QuickLook nGeniusONE Platform for Unified Communications Unified Communications and Collaboration (UC&C) environments are constantly evolving, expanding and improving. At any given time, IT teams may be in the middle of a new rollout, perfecting last year’s deployment, or creating plans for next year. No matter if the project is an IP Telephony system rollout or upgrade, a SBC deployment to support your SIP Trunk strategy, or the introduction of collaboration services such as Microsoft® Skype for Business or Cisco Jabber®, triaging problems fast is essential. 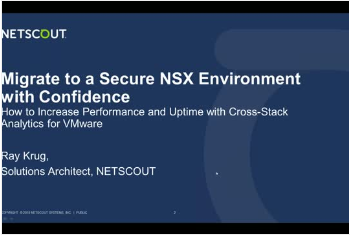 Webinar Secure and Successful Deployments of NSX: Extend Your Visibility with NETSCOUT Ray Krug, Enterprise Solutions Architect as he discusses how you can leverage NETSCOUT, a VMware Ready Certified Partner in Networking and Security for SDDC space, and your existing nGenusONE Service Assurance platform to extend continuous visibility of your micro-segmented environment, to assure the successful deployment and ongoing security and performance of services in your NSX environment. Data Sheet nGeniusONE: Service Assurance Platform The nGeniusONE® Service Assurance platform provides an overarching view into the performance characteristics of all infrastructure and application components associated with delivering IP-based services, including Unified Communications. With emphasis on service triage and network troubleshooting, the nGeniusONE platform combines real-time monitoring, historical analysis, and multi-layered analytics capabilities for a holistic performance management solution. This unified perspective enables IT organizations to more effectively manage the health and availability of diverse application environments, improving network and application teams’ ability to proactively identify and triage performance issues, assess business impact and quickly identify the root cause of problems. QuickLook nGeniusONE Solution for Media Quality Degradation in network performance, impacts on voice and video media quality, resulting in problems such as one-way audio, gaps in voice conversation, and frozen video sessions. When such issues arise, IT teams need solutions to quickly find the root cause for these problems. Unlike narrowly focused point tools, the nGeniusONE® Service Assurance platform provides a holistic view of user experience for all converged IP-based services to help protect end-user experience. Whitepaper Assuring the Enterprise in the Digital Era Knowing what’s happening on the network is important; knowing why it’s happening is the new imperative for the digital enterprise. Data Sheet vSCOUT Software The vSCOUT™ software complements existing Adaptive Session Intelligence™ (ASI)-based hardware and software instrumentation to provide the same level of visibility within virtualized infrastructures, even when the underlying infrastructure is inaccessible, such as in a public cloud. vSCOUT is ideal for monitoring services within virtualized hosts in data centers. QuickLook nGeniusONE Solution for Microsoft Skype for Business Organizations are implementing Microsoft® Skype for Business (Skype) Unified Communications and Collaboration (UC&C) services (including the former Microsoft Lync® technology) to improve communications, productivity, and collaboration among their employees, partners, and customers. The Skype collaboration platform is designed to connect with anyone, anywhere, on any device. The solution also offers enterprises the benefit of integrating with Microsoft Office products and Microsoft® Exchange environments. Whitepaper Unified Communications & Collaboration: Clean-Up Guide In today’s complex, multivendor environment, simple ongoing preventive actions can minimize painful service degradations or unplanned outages and assure the availability and quality of your UC&C system. Data Sheet vSTREAM Virtual Appliance The vSTREAM™ virtual appliance complements existing Adaptive Session Intelligence™ (ASI)-based instrumentation to provide the same level of visibility within virtualized and cloud infrastructures that is already possible in physical environments. The vSTREAM virtual appliance is ideal for monitoring service-critical traffic running within virtualized or cloud infrastructures, either locally on a host or as an aggregation point for multiple hosts. With complete visibility across physical, virtual and cloud networks, the vSTREAM virtual appliance presents real-time views of end-to-end call trace data and network-wide KPIs, to protect the reliability and availability of networks and application services. QuickLook nGeniusONE Platform for SIP Trunking SIP Trunking is a part of most enterprise organization’s Unified Communications and Collaboration (UC&C) strategic direction today. There may be a completed deployment, a partial implementation with additional site rollouts on the horizon, or a plan for the first installation in the coming budget cycle. Regardless of the stage the SIP Trunk project is in, IT staff needs performance management visibility to rapidly triage issues in the complex UC&C environments that now have SIP Trunking. Whitepaper Unified Communications and Collaboration for Dummies This Dummies book is your essential pocket guide for those looking to assure the availability and quality of their Unified Communications & Collaboration (UC&C) services. It provides a comprehensive reference, including innovative case studies on UC&C service assurance, what it is, how it can benefit your infrastructure, your organisations and IT professionals, as well as ideas on the best way to implement it. Data Sheet Service Assurance for Cloud Services Dramatically accelerate your Migration and Technology initiatives in the Cloud while maintaining your business continuity and corporate leadership. Protecting information and people is the top priority for many government agencies, yet it has never been more difficult to achieve than it is today. Agencies must have real time, accurate insights into their IT security situation to enable swift and effective responses to cyber-threats. 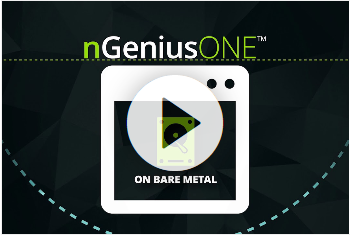 The nGeniusONE solution provides the visibility into potential service performance problems, enabling IT teams to proactively triage outages or degradations before they impact users, accelerate through security forensics, and rapidly respond to problems. NETSCOUT Arbor understands this and has developed industry leading DDoS and Advanced Threat Protection cybersecurity solutions. NETSCOUT Arbor Advanced DDoS solutions consist of a fully-integrated combination of in-cloud and on-premises products and services. Arbor Spectrum is a high-performance solution that helps organizations detect and confirm hidden threats and also uses global threat intelligence from the Internet to proactively identify high-risk advanced threat indicators on an agency network. With NETSCOUT Arbor, government agencies can keep services available, empower security teams with global intelligence, and quickly find lurking threats. What is a Memcached DDoS Attack and How Can You Stop It? Memcache is an open source, distributed memory caching system used to help improve the speed of websites. 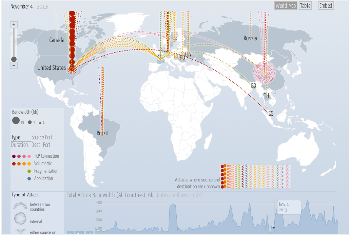 Digital Attack Map - DDoS attacks around the globe. 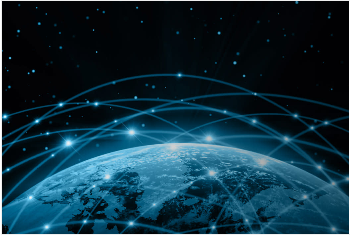 The digital transformation adds vulnerability, as malicious actors, nation states, or criminal organizations can capitalize on the interdependencies of our connected world. QuickLook nGenius 6000 Series Packet Flow Switch Service providers, private clouds, and large enterprises must contend with the collection, processing, and aggregation of traffic from a high number of network segments, while addressing space and power constraints in the data center and managing the migration to 40 and 100Gbps network infrastructure. 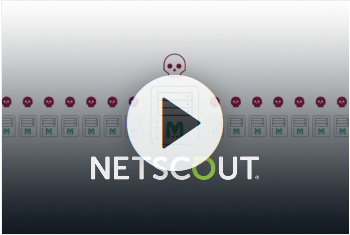 Video pfsMESH Learn how the self-organizing NETSCOUT pfsMesh enables resilient, high-availability access in the data center and across large deployments. Data Sheet nGenius 5100 Packet Flow Switch The nGenius® 5100 Packet Flow Switch (PFS) is a dense 100G model and is a part of the nGenius 5000 series of packet flow switches. The nGenius 5100 model is designed with 100GbE deployments in mind, and bridges the gap between 10GBE, 40GbE and 100GbE Ethernet networks and tools. QuickLook Security Visibility NETSCOUT® nGenius® packet flow systems (PFS) collect and organize the flow of traffic from the network to the security systems and monitoring tools — creating a unified packet plane that logically separates the network layer from the tool layer. Video Affordable, Scalable, Visibility for Inline Security Software-driven, open compute-based network packet brokers give you complete and pervasive visibility—for inline (active) or out-of-band (passive) security. They are easy to use, affordable, and scalable to meet your exacting security and network monitoring needs. Data Sheet nGenius 6002 Packet Flow Switch The nGenius® 6000 series packet flow switch (PFS) is a large-scale, high-performance, high-density blade and chassis system that bridges the gap between 1G, 10G, 40G, and 100G Ethernet networks and tools. Solution Brief Arbor DDoS Attack Protection Solutions To stop modern-day DDoS attacks, Arbor offers a comprehensive portfolio of fully integrated, incloud and on-premise DDoS protection products and services; all backed by continuous global threat intelligence. 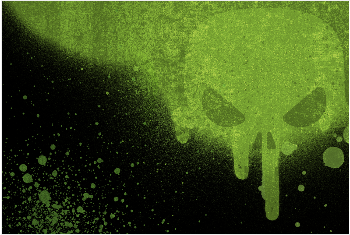 Whitepaper Insight Into the Global Threat Landscape NETSCOUT Arbor produces this annual report based upon a survey that specifically includes individuals within the operational security community. Survey participation continues to grow despite additional efforts to encourage recusal of respondents without direct network or security operational experience. Solution Brief Packet Deduplication in the Packet Flow Switching Layer The NETSCOUT® packet deduplication capability removes packet duplicates and provides a substantial reduction in the volume of traffic to the tools. This provides an increase in tool efficiency, a reduction in errors on the monitoring tool, and a closure of security holes that exist in other implementations. The deduplication capability includes selective packet deduplication, keyed secure hash for identifying duplicates, configurable duplicate packet tracking time window, discard of all subsequent duplicates of any packet within the specified time window, and the generation of duplicated traffic statistics. Data Sheet nGenius Packet Flow eXtender Software Packet Flow eXtender (PFX) is a software application enabling expert packet conditioning for service assurance and cybersecurity monitoring. The solution is built on the NETSCOUT InfiniStreamNG platform and framework leveraging patented technologies. As part of the nGenius® Packet Flow System (PFS) portfolio, PFX integrates with NETSCOUT’s broad set of packet broker products to enable expert-level capabilities, such as NetFlow generation and IP tunnel termination. The PFX application runs on multiple InfiniStreamNG hardware appliances and on several x86 server platforms, providing scalability on demand in a cost-effective manner. Solution Brief Protecting Sensitive Data During Monitoring GDPR, HIPAA, PCI-DSS, etc. define the types of personal data that may be collected and recorded, as well as where this data can be sent. To ensure compliance, networking and security teams need to understand which countries’ data will be traversing the network, what paths the data will take, where the data will be stored, and all the locations that will have monitoring tools and security applications deployed. Data Sheet nGenius 2200 Series Packet Flow Switch Hardware-accelerated packet optimization for performance monitoring and security systems on 10G networks. Data Sheet nGenius 4200 Series Packet Flow Switch Hardware-accelerated packet optimization for performance monitoring and security systems on 40G networks. QuickLook nGenius 4200/2200 Series Packet Flow Switch Service providers, private clouds, government organizations, and enterprises must contend with the collection, processing, and aggregation of traffic from a number of network segments. They also need to address space and power constraints in the data center, while managing the migration from 10 Gbps to40 Gbps networks infrastructure. The evolution of Flat Leaf & Spine designs of networks that has been accelerated by network virtualization technologies, has created considerably more “East-West” traffic as the perimeter and edge are extending in all directions and public cloud adoption accelerates. Smart Visibility must provide a 360 degree view of IT services; be cost effective to enable IT to deploy anywhere throughout the hybrid multi-cloud environment; be continuously monitoring application performance on the network proactively; and apply to multiple Service Assurance use cases providing a single pane of glass of the user experience. NETSCOUT, the industry leader and pioneer in wire data analytics, provides smart visibility through our next generation platform for Network and Application Visibility, Monitoring, Analytics and Reporting. 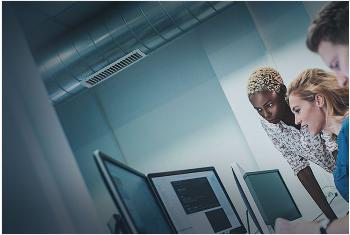 With NSX, networks can be programmatically managed and provisioned on demand, resulting in improved service velocity, enhanced security, and rapid disaster recovery. Demo Skype for Business-UCQuality Demonstration of performance monitoring for unified communications and collaboration applications. Demo UC & Converged Environments - Analyzing WAN Congestion Demonstration of analyzing Unified Communication environments and WAN congestion. Demo Live Demo of OptiView XG XG expedites network performance problem solving by automating root cause analysis and providing guided troubleshooting to address problem areas - anywhere on the network – wired or wireless. Solution Brief Tips and Tricks: Network Troubleshooting It’s imperative that network admins have the ability to troubleshoot problems quickly and accurately. Achieving this goal requires a mix of skill, process and tooling. This paper explores proven tips and tricks for network troubleshooting taken from reviews by real users of network hardware on IT Central Station. It reveals how today’s network professionals combine knowledge with the right tools to solve vexing network problems quickly and efficiently. Data Sheet nGenius 3900 Series Packet Flow Switch nGenius 3900 is the industry’s most flexible monitoring switch, powered by a hardware-accelerated 720 Gb/s in every slot. Data Sheet nGeniusPULSE nGenius®PULSE is the latest addition to the nGenius Platform, adding synthetic testing and infrastructure health monitoring. nGeniusPULSE extends the service-oriented approach of nGeniusONE and Adaptive Service Intelligence™ (ASI). When a problem is identified by nGeniusONE and isolated as a potential infrastructure element, IT can drill down directly from the nGeniusONE console to the underlying infrastructure. With one contextual workflow, IT doesn’t need to stop the process and start using a separate infrastructure component monitoring tool. Data Sheet OptiView XG: Network Analysis Tablet The wireless companion to nGeniusONE for full WLAN lifecycle management and troubleshooting network infrastructures. Solution Brief Enhancing Application and Security Assurance for VMware NSX Environments The challenges of digital transformation are driving enterprises to seek new levels of operational efficiency, business process agility and security in their essential business applications and services. NSX is VMware’s innovative Software Defined Data Center (SDDC) solution that delivers simplified management, micro-segmentation security, provisioning agility and enhanced data center economics. With NSX, networks can be programmatically managed and provisioned on demand, resulting in improved service velocity, enhanced security, and rapid disaster recovery. Data Sheet InfiniStream 2900 Appliance The InfiniStream® appliances form the foundation for the nGenius® solution. Strategically deployed throughout network, these appliances intelligently and passively perform advanced deep packet capture and analysis leveraging Adaptive Service Intelligence™ (ASI) technology. Offering unsurpassed traffic scalability, the InfiniStream appliances are integrated with the nGeniusONE™ Service Assurance platform to provide a common set of packet-flow-based metadata for use in troubleshooting and post-event forensics analysis, application response time and real-time analysis, and detailed key performance indicators. Data Sheet InfiniStream 4500 Appliance The InfiniStream® appliances form the foundation for the nGenius® solution. Strategically deployed throughout network, these appliances intelligently and passively perform advanced deep packet capture and analysis leveraging Adaptive Service Intelligence™ (ASI) technology. Offering unsurpassed traffic scalability, the InfiniStream appliances are integrated with the nGeniusONE™ Service Assurance platform to provide a common set of packet-flow-based metadata for use in troubleshooting and post-event forensics analysis, application response time and real-time analysis, and detailed key performance indicators. Case Study Canadian Public Healthcare Agency Supports Critical Patient-care Services through Actionable Intelligence nGeniusONE, InfiniStream, and nGenius Packet Flow Switches offer insights for rapid resolution of problems. 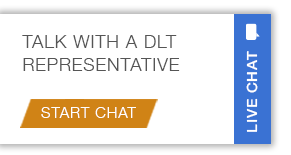 DLT’s systems engineering expertise cover the information technology lifecycle. They move projects from concept, to planning, to development, implementation, and support. Our approach to systems engineering centers on understanding and defining customer needs and utilizing structured methodologies to provide efficient and successful results. Our engineers, solutions architects, and subject matter experts work with you to implement your solution and provide flexible delivery options. Working alongside a Project Manager, they install your new systems rapidly and efficiently, to your requirements. After implementing your new solution, our experts are capable of training you on every product purchased. The DLT Innovation Center leverages the DLT’s more than two decades of government industry engineering experience. It highlights DLT’s innovations and strategic technology solutions from leading partners in the areas of Cybersecurity, Cloud, Big Data & Analytics, Business Applications, IT Infrastructure Application Lifecycle. The DLT Innovation Center offers customers the ability to test products in real-time to see first-hand how new software version will support and impact their mission.